Buzz about mobile continues to increase as businesses, social platforms, and even search engines focus on the growth and ease of its use. Hopefully, after our last post on the importance of being mobile, we’ve convinced you that not having a mobile website nowadays is a huge mistake. While marketers appreciate the overall value of mobile, they have yet to realize how for customers, it’s all about what it allows them to accomplish. Thanks to Google, we have some new insider insight into how we can think like our mobile customers, and thereby optimize our mobile presence. We all use our smartphones for a variety of things, and we’ve all probably experienced a time when we were bombarded with ads or other marketing ploys on our phones when looking for a social escape. It’s annoying and unwanted. But what about those other moments, when we’re focused not on social, but on quickly finding some pertinent information via mobile? Micro-moments. Google presents evidence for us that consumer behavior can be broken down into these moments in time where our own boredom, lack of focus, stress at work or elsewhere can cause us to turn to our phone for answers to the following: I want to know… I want to do… I want to go… I want to buy… You’ve probably had one of these moments yourself. We all have. But you might be surprised to learn that these moments matter for your business. Google says, “These micro-moments are critical touch points within today’s consumer journey, and when added together, they ultimately determine how that journey ends.” We’ve discussed the customer journey largely as it relates to your website, but Google suggests it’s a bit of a different journey on mobile. The keywords people use to search on mobile devices are different from desktop queries. This has to do with a number of factors; first, now over 20% of mobile queries are voice searches. Second, mobile searchers typically have different, more urgent needs in mind. For example, while a mobile searcher may audibly ask their smart phone where to find the closest equipment dealership, a desktop searcher is likely searching the top dealerships in the greater area or state and is still in the early research phase- further away from a conversion. 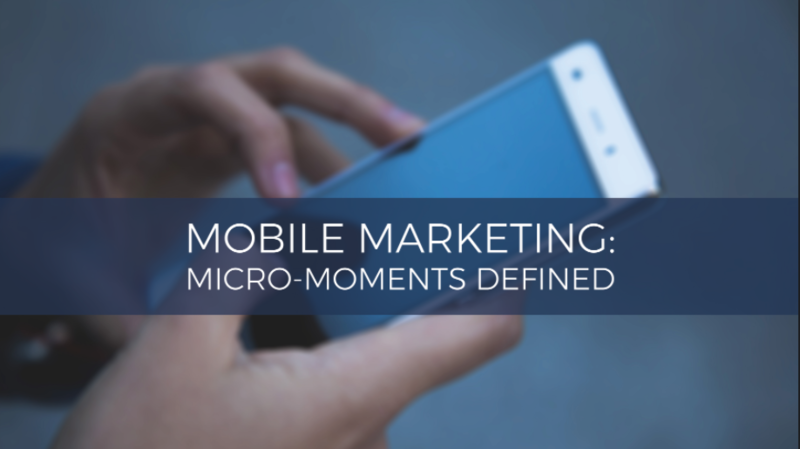 Let’s break down these micro-moments. I want to know ___. More than ever, customers are craving education from brands in small, bite-size form. 69% of smartphone users are more likely to buy from companies whose mobile websites or apps help them easily find answers to their questions. By providing this in unique ways, through video or an easy to find FAQ tab, you will win both affection and authority from your customer. I want to do ___. Google’s data reveals 48% of smartphone users are more likely to buy from companies whose mobile websites provide instructional video content. Consider how you might help your community! For example, you could provide a quick video through your website or social media on how to winterize your equipment. I want to go ___. “Near me” searches have doubled in the past year, as apps like Google Maps easily direct consumers to their closest needed location. This is great news for our dealers who do the majority of their selling on location! Ensuring you are showing up under searches like “equipment dealer near me” within the proximity of your dealership is essential to snatching these mobile customers. I want to buy ___. 82% of smartphone users consult their phone while in a store. Continually watch your competitors’ seasonally-changing offers to ensure that your prices are competitive with theirs’ season to season. That way when your customers are having this price-check-via-mobile moment, you’ve done your homework on whether or not they’re likely to stay or go based on what the other guy offers. Afterall, you can’t find an excavator on Amazon! Trust me, I checked. Now you are not only aware of these micro-moments, but how valuable it can be to develop content that is geared towards your customer’s spontaneous search behavior. Stay tuned for our follow-up post on how to make these micro-moments an effective lead generation opportunity for your prospects and current customers.